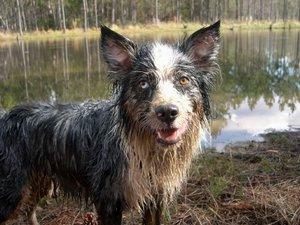 Is your home beginning to smell like a wet dog? If so, give Wendy Nan Rees' recipe for Smelly Jelly deodorizer a try. I live in California where the climate is temperate for most of the year. Since I live with three dogs, I am very aware that people entering my home, whether it is the first time or the fiftieth time, may smell "doggy" odor. I'm lucky because in such a temperate climate, I could just open doors and windows to air out the house in case there is an accident. But let's face it, in other parts of the United States and around the world, not everyone is this lucky. When the weather isn't suitable for airing out a pet owner's home, the living space can take on that "doggy" smell associated with our pets. It's nobody's fault. It's just one of the things you deal with when you own dogs or pets of any kind. A good friend gave me a homemade room deodorizer as a gift one year and I loved it. It's a scented gel in a jar that releases a wonderful scent over a period of time. I have since amended the original recipe to help my dogs relax if they are wound up and to invigorate them if they are sluggish. I now pass on the recipe to you. You can easily make it yourself and use it for either deodorizing your house if it needs it or as a bit of aromatherapy for you and your dog. I love giving out jars of this "Smelly Jelly" at holiday time, because they are simple to make and don't cost much. If you take the time, you can make the jars look very pretty, and your friends will go crazy for them. You don't have to tell them how easy it is to make, just sit back and accept the compliments. A word of caution first; many aromatherapy oils can be quite toxic when ingested. Always keep your jars of Smelly Jelly room deodorizer well out of your pet's reach, and call your vet if you suspect your pet has eaten any. 1. Boil water according to package directions for 4 envelopes of Knox Gelatin® 2. Remove from heat. 2. Add 4 envelopes Knox Gelatin® and 1-tablespoon salt. Stir until dissolved. 3. Add 40 drops of Lavender oil and food coloring to your desired color. 4. Pour into clean jars and allow to set. 5. Quickly, lightly cover and refrigerate them to speed up the process. If you want to get fancy, you can buy some cute jelly jars that have fun tops with plaids, stripes, dots, etc. Tie some raffia around the jar (you can get this at any craft store), to add the finishing touch. If you cannot find raffia, use any pretty bow you want. Sometimes I save my jam jars (i.e. Smuckers), that already have a cute plaid top. I just want to say again, this deodorizer/aromatherapy product really does make a great hostess gift. I hope you try some of these fun and wonderful smelling tips. Sometimes when we have our furry loved ones, we become immune to the odors that come along with them. Nevertheless, remember that our friends often do not.